A half full bag of Purina One dog chow sits in a corner of my kitchen. I should pass it on. Selecting a Christmas ham the other day, I thought about which tidbits I’d tidy to the dog dish, saving them for Evie. 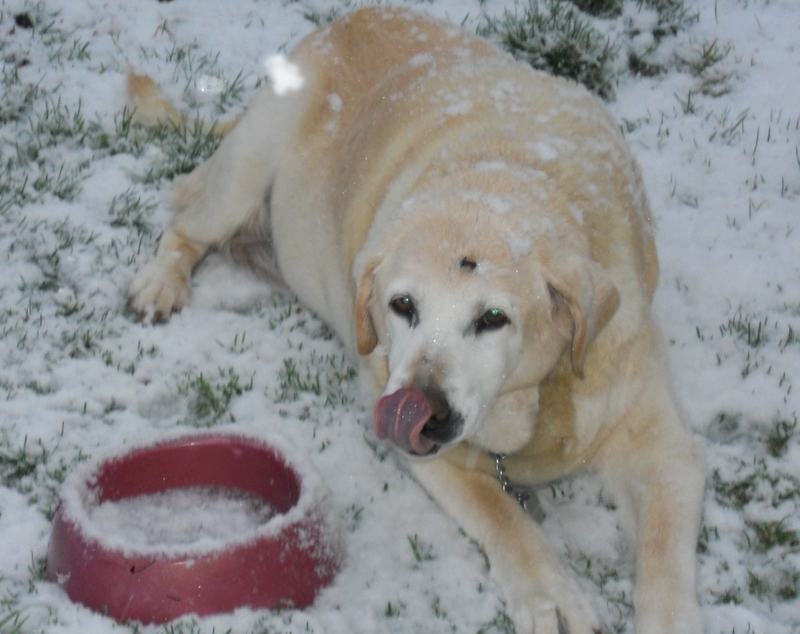 A boon companion of fourteen-plus years, Eve passed away on December 19. The Eve-less days that followed gimped along with the alacrity of crippled snails on crutches. Emotions rose and fell like the tide. The traditional merriment suggested by the calendar mingled with bereavement, stirring up a cocktail both sweet and tart, like strawberry-rhubarb pie. I didn’t know which flavor to bite in to. And finally chose neither. Chris didn’t ask which one. In Washington State, there’s only one. Our yellow Lab knew Mount Rainier well. Even though she wasn’t allowed on the trails or in any building, Eve loved camping trips to the Mountain. In fact, Evie didn’t seem to care where she was – as long as she was with us. The first time we took her camping at Ohanapecosh on the southeast hip of Mount Rainier National Park, Eve was uber-miffed about being left outside the tent for the night. As in, “What’s the deal with this, family? How come you’re in there and I’m out here? !” After making her consternation clear, Eve wound up inside, where she promptly plopped onto my feet and drifted into a contented sleep. And so Mount Rainier was a natural choice for our final goodbye to Eve. Cramming a last-minute trip to the Mountain into Christmas Eve meant a long, glacial, and exhausting day. But I couldn’t stand the thought of waiting until spring. 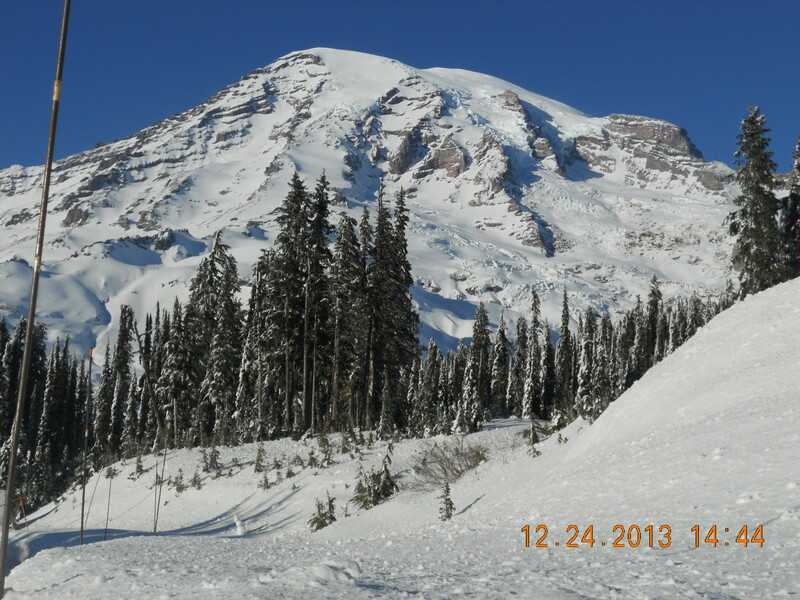 Chris agreed, which is how we wound up heading to Mount Rainier the morning of December 24. The car was quiet as we churned out the miles to Ashford and a secluded glen near the Mountain’s southwest flank. Because it requires a steady uphill climb and good land navigation skills to find, the quiet meadow sees few visitors. We discovered it on a previous hike and were dazzled by its September beauty, bursting with blueberries and late wildflowers, hemmed by a laughing creek and soaring evergreens. The three of us – me, Chris and youngest son Josiah (14) – stopped, parked, and took our time, breath exhaling in frosty plumes as we wordlessly crunched over virgin snow to a corner of the meadow. The Mountain towered overhead in ermine mantle and white-satin snow skirts. An achingly blue sky hung out wood smoke in rungs. Chris retrieved the urn of Eve’s ashes from his back pack and handed it to me. Clumsy in thick winter gloves, my fingers fumbled with the lid. Maybe it wasn’t just the gloves. I handed the urn back to Chris. He opened it and handed it back. I knew the protocol. Last words. A final goodbye. Toss. The three of us stood there, sniffling. None of us trusted our voices. After a few minutes Chris offered a brief prayer. 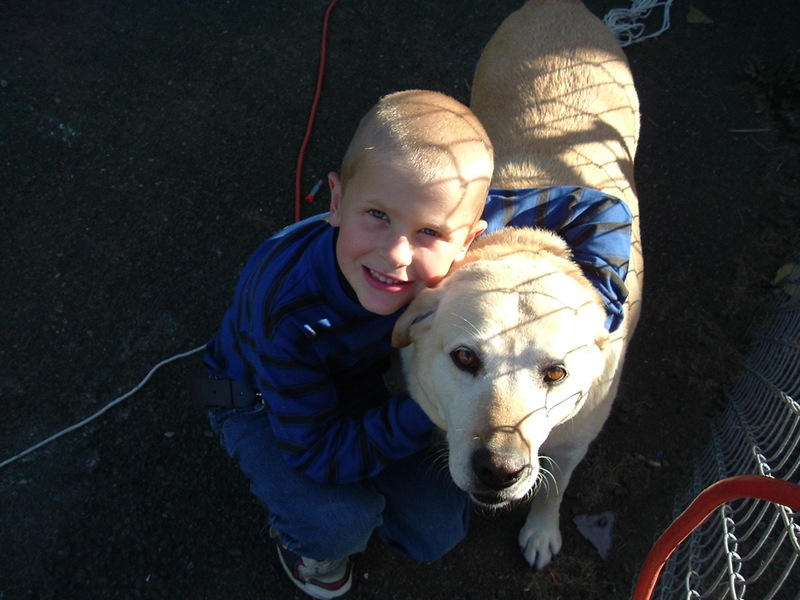 We said nothing more, choosing to be alone with our separate thoughts of a gentle yellow Lab who came to us as a “cast off” but snuggled her way into our hearts as few have. Standing in the snow in the winter shadow of the Mountain, we took turns scattering Eve’s ashes. Toes turned numb. Noses reddened. Cherry-cheeked winds scrubbed cyan skies. “Good bye Evie” I finally whispered, holding a fine powder of ash in one gloved hand. “You were a good girl. We will never forget you.” I was the last to let her go, ashes floating on a galloping wind riding hard to Puget Sound. We drove into the park, stopping at Evie’s favorite places. A water dog, Eve loved the Nisqually River. Ohanapecosh. Tipsoo Lake. Christine and Narada Falls. We stopped near Cougar Rock Campground to chain up. We camped there a few years back, the six of us and Eve. The campground is closed now, asleep under a thick quilt of snow. We made it to Paradise by early afternoon. The alpine aerie is usually smothered under thirty feet of snow – sometimes more – from October through May. Once thawed, Paradise hosts outrageous wildflower runs in July and August, when its world-famous meadows erupt in a glorious bouquet of Renoir pastels. If you’re quick, you can glimpse creamy white dollops of avalanche lilies, waxy-yellow petals of Suksdorf’s buttercup, clusters of fragrant Sitka Valerian, pink bistorts, red-spotted monkey flowers and purple lupine. These vast carpets of floral color brush an iridescent canvas, but their blossoms are as brief as they are dazzling. 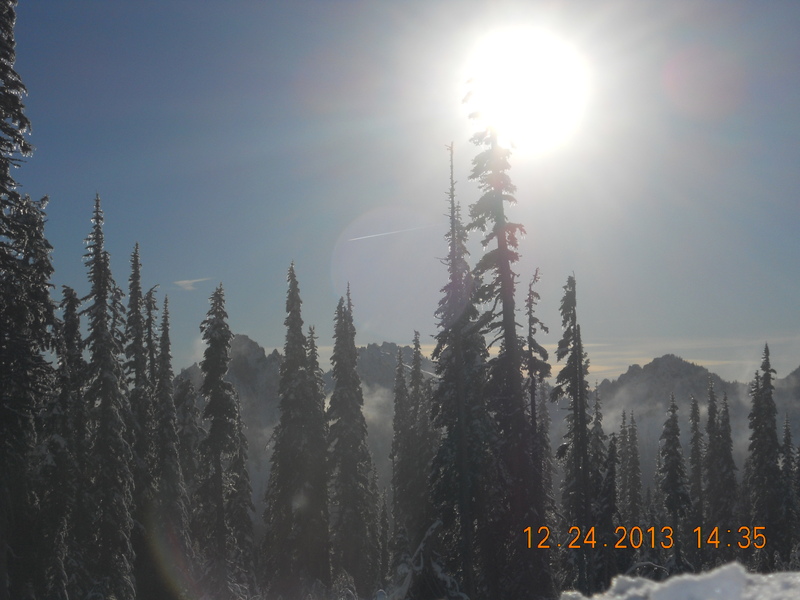 Afternoon faded and cotton-candy clouds fluttered over the Tatoosh Mountains like pennants over Yankee Stadium. Fog crept into valleys. Temperatures took a nose dive. We headed back to Longmire, the Nisqually entrance, and the three-hour return trip home. Just past Longmire, Josiah opted to remain in the car listening to Amy Grant croon about chestnuts and an open fire while Chris and I stopped at Tahoma Creek. We walked to the bridge and listened to the frigid waters rush to the Sound as a cirrus sunset draped the sky in peppermint, grape and tangerine. A gusty December morning in 2007, when Eve wasn’t herself. She seemed agitated, on edge. A few hours later the Storm of the Century hit, plunging us into three days without power and heat. Somehow she knew. And I learned to pay attention. When son Nathan, then 14, returned from an eight-day hospital stay with a plate and seven screws in his leg, the result of a fractured femur. Eve was the first to greet him at the door. She never left his side during three long months of convalescence, crutches and rehab. How Eve roamed the house when I was out of town for a few days. She reportedly checked every room over and over, looking for me. She bowled me over with joy when I returned home, tawny tail wagging in furious delight. And then I heard it. Probably from a passing vehicle. Or maybe I just imagined it: A dog bark. Just once. Then night swirled out of the sky, punctuated by the sigh of a Northwest wind. Christmas is a season when we give and receive tokens of love. Eve gave not tokens, but love itself. The Mountain gives reminders that winter doesn’t get the last word. This season of bereavement will thaw. Snow will retreat. Chinook winds will swim over Paradise meadows. Wildflowers will burst into Renoir bloom. Spring will come again to the Mountain, as it will to us. When it does, I will remember Eve’s last gift. It came not in physical form or tangible shape like those items found under trees on December 25th, but in the solitude of a snow-studded meadow, an achingly blue sky, soaring evergreens and the cool kindliness of memory. Eve passed away on December 19, 2013. This post and its companion, Forever, Eve, were the highest rated posts of 2013. You can read more about our ‘best girl’ in my new book, Forever, Eve. * Watch for an update on the dog front! Coming soon! This entry was posted in Bereavement, Christmas. Bookmark the permalink. Great Love for a great Pet! I could not stop reading till I reached the end. 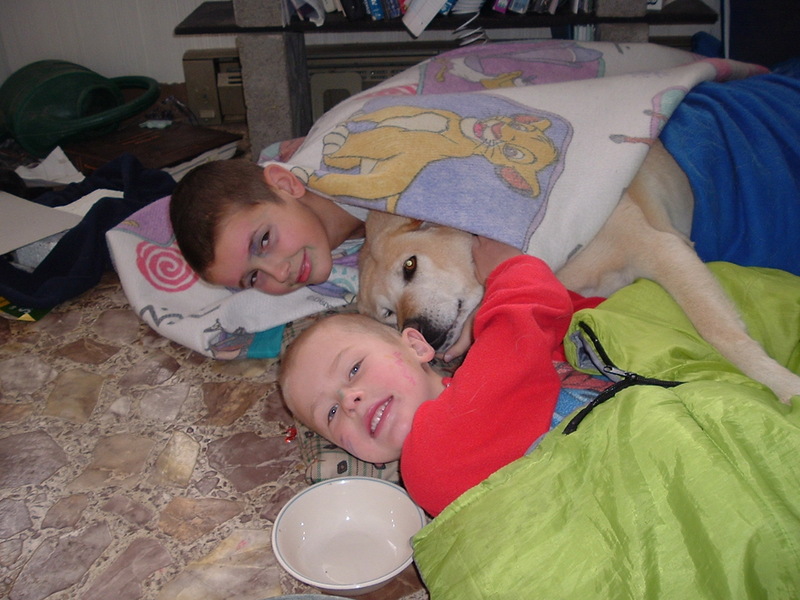 Choked up as I too remembered our girl Ginger, a Huskey mix we had while raising our 2 kids. 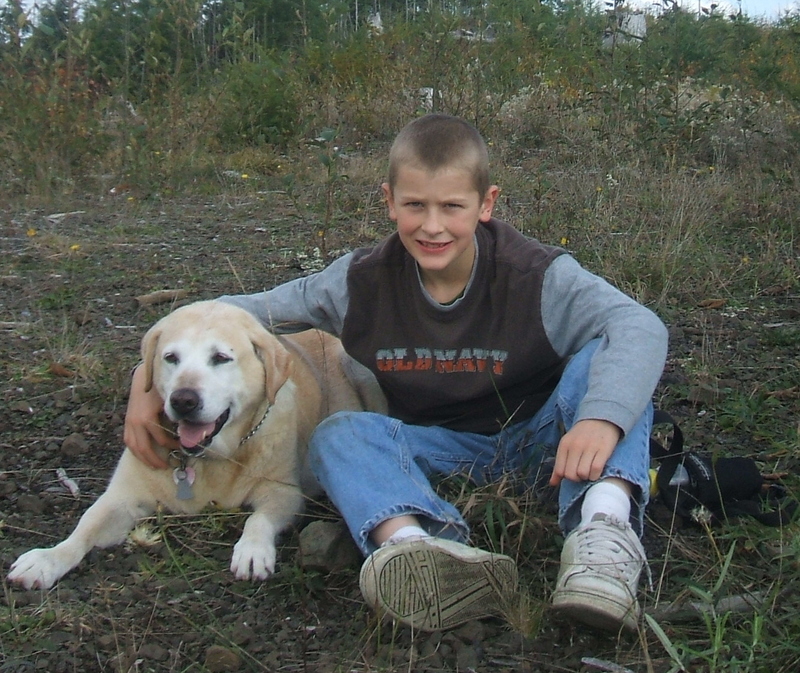 Best dog I ever had.